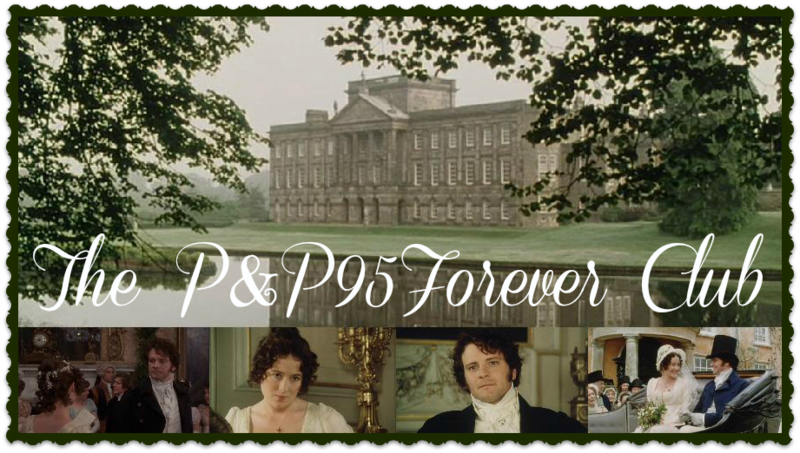 My introduction to P&P95 was my first introduction to Jane Austen period. Some of our friends the M’s mentioned the ’95 S&S when I was about 13 (about a decade ago), but we rarely watched any movies then. By rarely I mean only Veggie Tales, some Disney movies, other animated films (Thumblina, Swan Princess maybe), and the occasional real-people-movie (the ‘80’s Heidi and ‘60’s Hans Brinker are all that come to mind at the moment). We had not reached grown up classics in reading at this point either. The sister after me watched it with some acquaintances when I was about 14 and within a year-ish after that the M’s brought their taped-from-the-television-copy over to a sleep over. We watched part of it at night and part in the morning. Shortly after, my mom borrowed Pride and Prejudice from the library for us. The same friends introduced us to the Ciarán Hinds Persuasion, the Emma Thompson, Hugh Grant, Alan Rickman, Kate Winslet Sense and Sensibility, and the Kate Beckinsale Emma. I received the entire Jane Austen finished works (seven novels) for Christmas when I was 16 or 17. I have read them all plus some of her juvenilia and her two unfinished drafts The Watsons and Sanditon (kill me now, I know that the hero in this one could have been one of her best even though he wasn’t even introduced yet). I have attended three Jane Austen festivals in our area and will attend a 4th in the next two weeks. So, needless to say I greatly enjoy Jane Austen’s works, period drama films, and the Regency time period, but DON’T call me a Janeite or Austenite. I think it is sooo silly and limiting. I have since seen the 2008-ish Mansfield Park, Sense and Sensibility, and Persuasion. I will admit to seeing and enjoying…as. a. movie…the 2005NOTP&P, but it hardly bothers me (compared to my raised hackles over the Emma triumvirate) since it is so very much NOT Pride and Prejudice that it cannot seriously be considered a rival…just a poorly done more-of-a-chick-flick-than-period-drama film. Here are my favorites besides the REAL Pride and Prejudice: the REAL Emma (or MY Emma as I call it) with Mark Strong and Kate Beckinsale, and I am likely one of maybe 10 people in the world that prefers this version (I can enjoy the 2009 Emma but I HATE Emma herself; however I cannot enjoy the Gweneth Paltrow version), the Persuasion with Rupert Penry-Jones (I admit the this has flaws such as seasick making camera work, but he is AMAZING and the film blends both her original, discarded ending with her final, published ending), and the ’95 S&S (I can enjoy the newer one and prefer that Elinor and Edward because they are younger like they are supposed to be and Edward is sooo handsome and not awkward like the other one, but Marianne was poorly acted and Willoughby looked like a blackguard-also, and this is a big pet peeve-it was too modern feeling). Side note: During breakfast of the famous sleep over we discussed how awful Lydia was…and my then quite annoying 7ish year old little sister Lydia turned purple. We assured her that we were not discussing her. I promise you she was never, ever like THAT Lydia, and she now is about my age when I first watched it and quite enjoys the Jane Austen films and books herself (she emphatically prefers the 2009 Emma above the other Emma’s and is madly in love with that Mr. Knightley…so even my sisters aren’t on my side about Emma)! And we are not one of the ten who prefer the 1996 A&E Emma, as we find 2009 practically perfect in every way. But I do like the "brown-haired Emma" in its way. (Not Mark Strong, though. :P) It has some unique elements to offer which none of the other adaptations captured. If you're interested in participating in this blog series, you can read about it here.